What sets the WINNERS and the LOSERS apart from each other? Especially when both cases are Christians? It can be so infuriating and frustrating, am I right? OUCH! at least the car in front moved out of the way and I didn’t bust all the teeth out of my head. But I’m still bruised and beat up. After years of living defeated, broken, stressed-out, worn-out, and in a constant cycle of burnout, I knew there was a better way. I was confident that this COULDN’T BE THE ABUNDANT LIFE God had for me! There was MORE ahead for me, if I could just get my head above water to get to shore and find a map. Everybody wants to win in life, so how do we do it? Here are 4 Keys to Declaring Victory In Your Life. 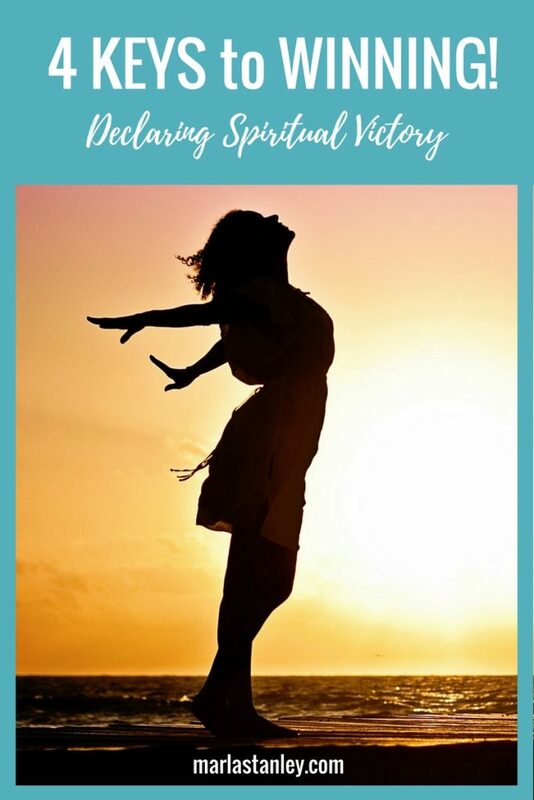 Whether you are fighting a difficult marriage, anxiety, depression, struggling to parent your rebellious kids, wrestling with addiction, or facing an eating disorder, these elements will help any believer find victory! First, you need to Know Your Enemy. Do you even know who it is you are fighting? I’ll give you a hint…it’s not your kid, spouse, the government, food, the scale, your job or boss, your body, brain, hormones, or your emotions. Ephesians 6:12 says, “For we do not wrestle against flesh and blood, but against the rulers, against the authorities, against the cosmic powers over this present darkness, against the spiritual forces of evil in the heavenly places.” (ESV) and John 12:31 refers to Satan as the “ruler of the world”. He is in charge here and now on earth, and he is on the attack. 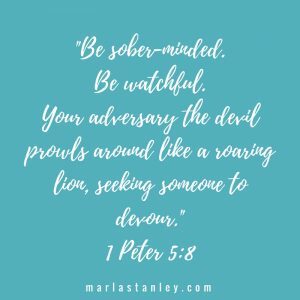 It’s time we got to know our enemy-realize that he will deceive and confuse, he will entice and distract from what is true. We have to be diligent to recognize his ways and learn to see through the fog. Friend, it’s time to sharpen your mind with truth and strengthen your wisdom muscles so that you can discern the schemes of your enemy! Second, you need to Know Who You Are. Neil T. Anderson does an incredible job of breaking down for you just who God says you are, and if you click through that link to Amazon you can snag a copy. YES, you need your own copy. Let go of the need to be perfect and mark it up, highlight, underline, draw pictures of your transformation, etc. The more you “get” this identity in Christ, the more FREE you will be in life! Third, you need to Know Your Weapons. Yep, weapons. Girls have them too. 😉 And no, we aren’t talking about physical weapons. We are talking about weapons of spiritual warfare. Check out Ephesians 6 for a full breakdown of your spiritual armor (starts in verse 10). Start putting on this armor daily, and you will notice a huge difference in your battles. Lastly, you need to Know How to Fight! Yup. Do you know how to throw a punch? or are you swinging at the air wasting all your energy hitting nothing? There is technique, strategy, and skill that comes into play here, and you have to strengthen your spiritual muscles and invest in your education to know when to use what tools, where to apply them, and how to defeat your enemy. Combat training. Like I shared in this video training (I teach a weekly “Success Call” on my facebook page), you can’t expect Satan to just step aside because God has told you to do something. Consider every individual in the Bible-Moses, Noah, Nehemiah, Mary, Deborah, even Christ-they all faced significant opposition before carrying out the task(s) God had set before them! Your enemy is sneaky and will pull out all the stops to defeat you. He knows that he loses the ultimate battle, so this is his time to shine and win on earth. Are you prepared for his attacks? Why is all this so important? Because this isn’t a one-time fight, and you aren’t fighting alone. Christ has already won the victory. Now all you have to do is step into your God-given identity, pick up your weapons, start training and overcoming!